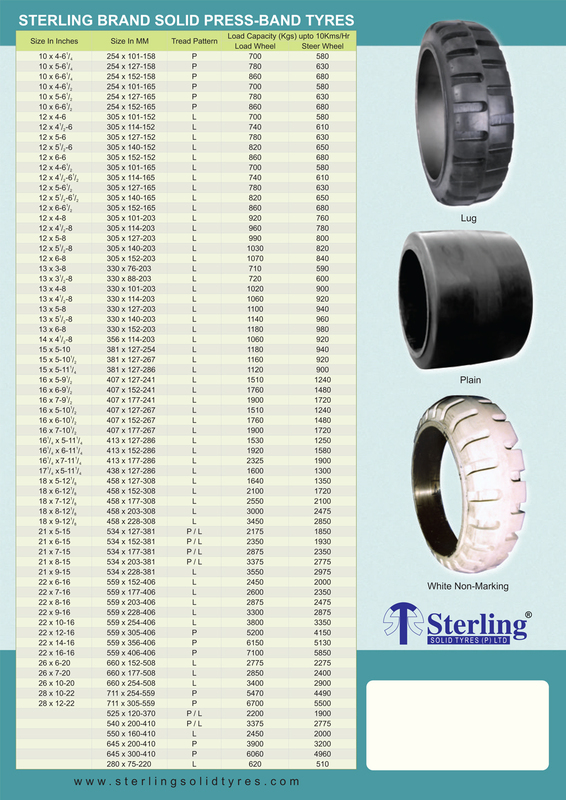 Sterling has made a total commitment to excellence in providing cost-effective world class Solid Press-on tyres. Reliable and economical, the resilient press-on solid tyres have the optimum quality of tread compound for extended tyre life and increased efficiency. Sterling's dynamically balanced Hi-lug Tread enhances its durability to perform under the most difficult conditions and makes it resistant to chipping and chunking. Press-On tyres are also available in hub type for easier assembly directly on to the wheel axle. In Sterling's manufacturing process, we use only the best cushion adhesive with the latest bonding agent ensuring zero chance of failure. 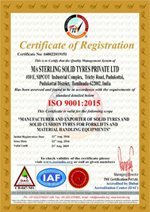 Sterling's non negotiable standards of quality control ensure that whatever the application whether hot or could, rough or uneven terrain, our Press-On tyre heads the field.